Poila Baisakh, or Noboborsho, is the Hindu New Year in West Bengal and Bangladesh is celebrated in the month of Vaishakh or Baisakh (April – May). 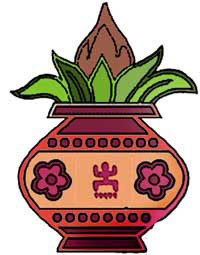 Poila Baisakh 2019 date is April 15. The Bengali New Year is popularly referred as Naba Barsha in Bengal and Pohela or Poila Baisakh in Bangladesh and is the first day in the Bengali Calendar. Bengali Year 1426 begins on the day. On Poila Baisakh, Goddess Lakshmi, the Hindu goddess of wealth, and Lord Ganesha are worshipped. Traders perform the halkhata ceremony that marks the advent of the Bengali New Year. All shops are decorated with flowers and one will notice stringed fresh lemons and chillies hanging in front of shops. This is used to ward off the evil eye. Shopkeepers, businessmen and traders close the old accounts and open a new one. People visit their favorite shop during the day to wish them luck for the year ahead. Traders welcome customers on this day with sweets. In Bengali houses, Noboborsho is noted for the special elaborate alpanas (rangolis or kolams). A kalash is placed in the center of the alpana design and it symbolizes prosperity. Houses are elaborately decorated with flowers as there is no shortage of flowers during this season. Another important event is the Prabhat Pheris or early morning processions. No Hindu festival is complete without the mouth watering cuisines. And Bengalis prepare both Vegetarian and non-Vegetarian dishes for Poila Baisakh.